Ιδανικό για χαλάρωση και διασκέδαση, το Sanctuary Nam Ngum Beach Resort βρίσκεται στην περιοχή Μπαν Τα Χεουα της πόλης Βανγκ Βιένγκ. Από εδώ, οι επισκέπτες μπορούν να έχουν άμεση πρόσβαση σε όλα όσα η πόλη έχει να προσφέρει. Από τη βολική της τοποθεσία, η ιδιοκτησία προσφέρει εύκολη πρόσβαση σε κορυφαίους προορισμούς της πόλης. Όλα γίνονται με γνώμονα την άνεση των επισκεπτών. Για τον σκοπό αυτό, η ιδιοκτησία προσφέρει ό,τι καλύτερο όσον αφορά τις υπηρεσίες και τις παροχές της. Για την άνεση και την διευκόλυνση των πελατών, το ξενοδοχείο προσφέρει 24ωρη υπηρεσία δωματίου, δωρεάν WiFi σε όλα τα δωμάτια, 24ωρη φύλαξη, ημερήσιος καθαρισμός, ασύρματη σύνδεση Wi-Fi σε δημόσιους χώρους. Οι πελάτες μπορούν να επιλέξουν από 23 δωμάτια καθώς όλα διαθέτουν μια ατμόσφαιρα απόλυτης αρμονίας και γαλήνης. ΟΙ ψυχαγωγικές δραστηριότητες του ξενοδοχείου, οι οποίες περιλαμβάνουν τις πλοία, κανό, ενοικίαση εξοπλισμού θαλάσσιων σπορ, ιδιωτική παραλία, εξωτερική πισίνα, είναι σχεδιασμένες για να χαλαρώνετε και να ξεφεύγετε. 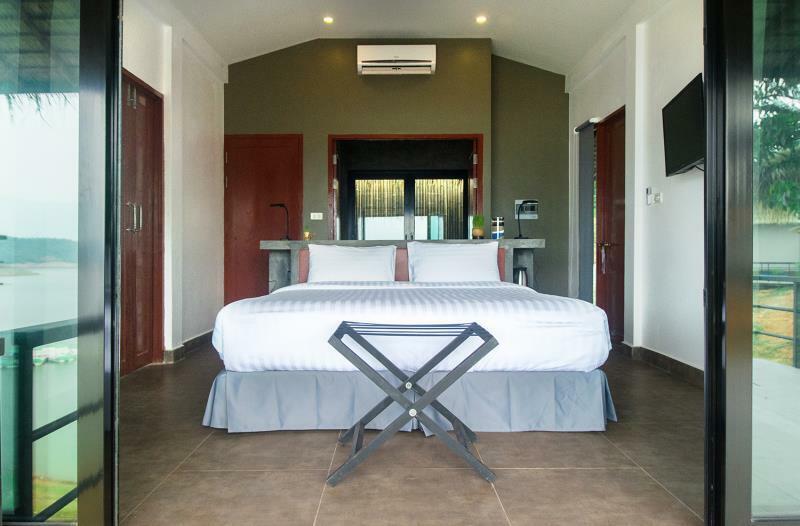 Το Sanctuary Nam Ngum Beach Resort είναι ο ένας και μοναδικός προορισμός για εσάς που ψάχνετε ποιοτικά καταλύματα στη Βανγκ Βιένγκ. 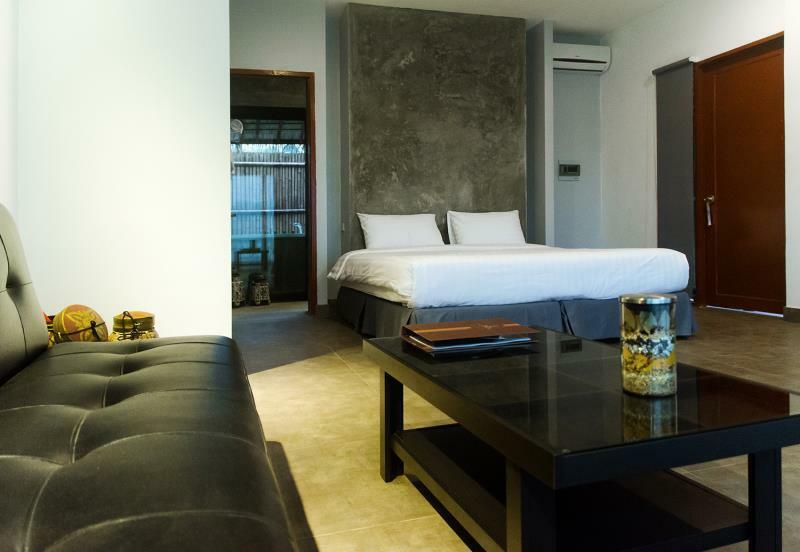 The property can be reached by road from Vientiane (120 km) or Vang Vieng (25km) via public or private transport. All mini buses drive via Tha Heua village and drop off can happen upon request. For further queries, please contact the property directly. We are city couple and wanted a get away for a few days. This is the right place I had chosen. The room is along the lake and scenery is great! Clean and tidy rooms. Surroundings is less car and less people, unlike the place I came from, Singapore. I had a great time in this resort. Relax and quiet. The only minus point is the food is not that fantastic. I will come again next time. My favourite hotel I stayed at in Laos. We booked at first for two nights and knew we would extend our stay once we saw the hotel. First note that this is not in the city, it’s about a 20 minute drive, we got the bus from Vientiane to drop us off on the way or the hotel offers shuttles from Vang Vieng. This is a place to go and just relax and unwind. The staff is super helpful and accommodating but not pushy with anything. There are activities you can book, boats to rent, and bikes to borrow or you can do what we did, just relax and enjoy the beautiful room and view. The hotel and well maintained and clean and comfortable. If you get chance book this hotel, I was so impressed and want to go back. The lake is actually a damp so it's not nice to swim but great to go on kaiking - though those could be free (are very expensive). The hotel is super nice for Lao average. Bathtub wouldn't fill up with hot water which was very annoying. Shower and bathroom are super nice though it doesn't have a "box" so it gets all wet but it dries quickly. The room is great though not with fancy details as you would expect on seeing website/price. Make sure you ask for a nicely located room - most of them are great just a few have balconies that can be seen very closely from the restaurant and pathwalk. Staff is great and helpful though can be confusing and slow when solving problems. It's all in USD not kips which makes it more expensive then anything else in Lao. Great price for wine by glass :) Good food!!! It was the best stay in Laos. Hotel is little bit far from Vanveing but if your purpose is relaxing, just make reservation here. Moreover they have shuttle service to Vangvieng. Room was clean, staffs are kind with good English, breakfast not bad, and the view, it was just perfect. They always give us a good service about I asked. Someone said there are many mosquito but it doesn’t matter as they have spray. Just say to reception. Of course you can make a bus or mini ban reservation to Vientiane at the hotel. We were so amazed and surprised to find this place when we came about the sunset time. It’s nothing like the photo they put on Agoda, just the way better in actual eye. 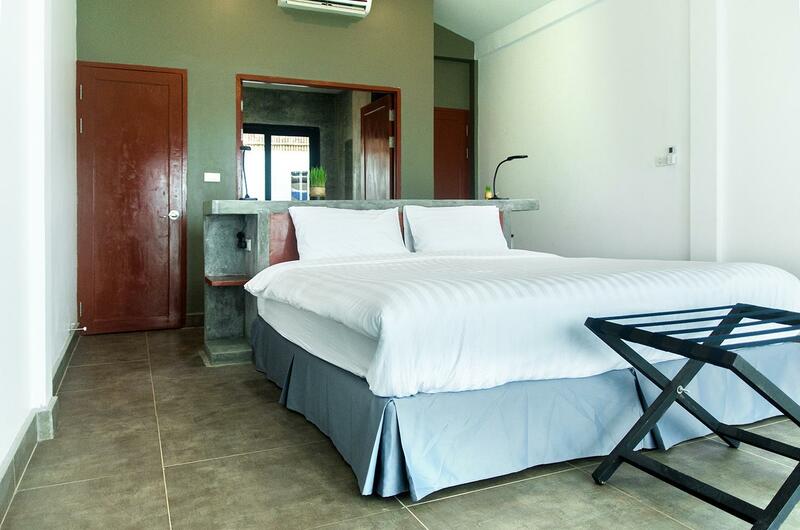 Set in the artipelago of the Nam Ngum Reservoir, all the rooms look towards the water with large terrace. Bed is king size and so comfy, they have a large bathroom (sadly no bathtub). Room is not big but it does not matter in such a beautiful setting. We truly enjoyed jet-skiing in the reservoir... which is incredibly big and we were totally lost with joy between many islands!! It was quite far from bangbieng main street (~30 minutes from minivan), so you can book a minivan from the resort, or use free shuttle at 9 am and 2 pm. But the resort were comfortable and breakfast also good. If you have an enough time, you can walk around Ngum river. 위치가 ㄱHJMang이지만 나름 가격대비 위생도 좋고 식사도 맛있고 편의시설 관리(수영장, 선셋의자)가 굉장히 잘 되어 있는 곳입니다. 여유롭게 방비엥을 투어하고 싶은 분들께는 적극추천, but 빠르게 2박3일 방비엥에 머무르실분들께는 비추! if you want to experience breathtaking view, I would highly recommend for this hotel. The hotel have distance with Vanavieng downtown, (around 25 -30mins via tuk tuk or Shuttle bus) but it's worth to stay in the hotel if you want have wonderful moment. Private pool was absolutely amazing! Dear customers, On behalf of the entire team Sanctuary Hotels and Resorts, we wanted to thank you for the kind comment that you left on Agoda, It has made our day. We were delighted to be able to bring you entire satisfaction. Indeed, we make sure to provide you with the greatest level of service and satisfaction at the Nam Ngum Resort. 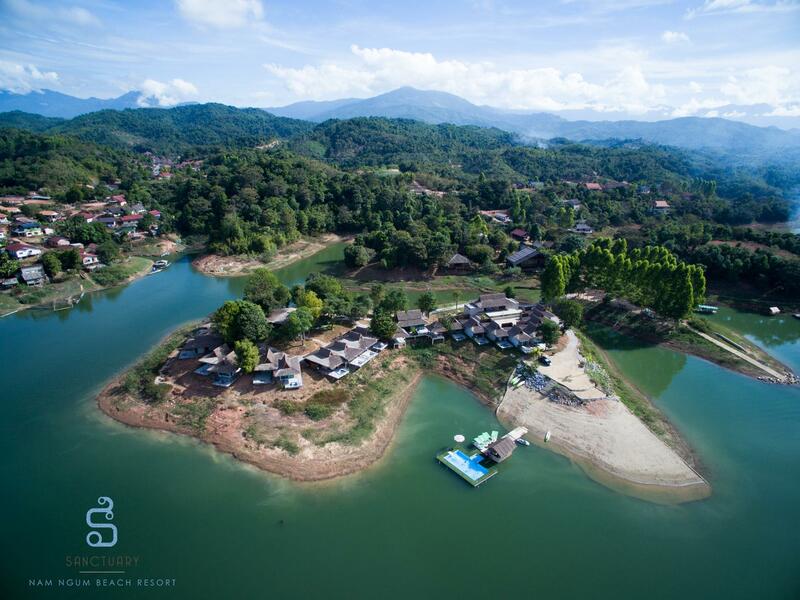 It is a true paradise that offers both relaxing times with its sandy beach and swimming pool on the lake, but also offers water activities for your enjoyment. We do hope to welcome you again very soon. Meanwhile, Sanctuary hotels and resorts and I wish you a pleasant stay in Laos. Free pick up from Vang Vieng in front of BCEL at 10 AM or 5 PM but you need to book your room and they will send the driver. Thanks for sending us to the petrol station to wait for the bus to Vientiane. We booked bus with the resort, same price with booking in Vang Vieng downtown. Away from the center of Vang Vieng, this is a really quiet and scenic place to be be. Loved it. We had a splendid time here. The lake is majestic, the room is comfortable and clean, with a spacious, pampering shower unit. The staff was welcoming, caring and helpful. The restaurant is decent - it was very (very) useful to have this option right outside - but it's easy and worthwhile using one of the other options - in town or in nearby resorts. Dear customers, On behalf of the entire team Sanctuary Hotels and Resorts, we wanted to thank you for the kind comment that you left on Agoda. It has made our day. We were delighted to be able to bring you entire satisfaction. Indeed, we make sure to provide you with the greatest level of service and satisfaction at the Nam Ngum Resort. We do hope to welcome you again very soon. Meanwhile, Sanctuary hotels and resorts and I wish you a pleasant stay in Laos. We arrived at the resort shortly after their opening. Everything is brand new and shiny. The staff are excellent and helpful. There are several resorts in the area and this one is clearly the gold standard. The swimming pool in the lake is inviting and great to cool off in clean water. The food was of good quality and mostly available on demand. The facilities and equipment like kayaks and boats are available and reasonably priced. I was very content with my experience at Sanctuary Nam Ngum and will definitely be back. Great place with few things missing . Hard to walk bare foot without being cut by gravel . No yoga space . N water jet n boating r pretty noisy . Dear customers, On behalf of the entire team Sanctuary Hotels and Resorts, we wanted to thank you for the kind comment that you left on Agoda. We were delighted to be able to bring you entire satisfaction. Indeed, we make sure to provide you with the greatest level of service and satisfaction at the Nam Ngum Resort. Also thank you for sharing with us the issue concerning an issue gravel on the groud for walking. Be sure, that I will personally take care to relay it to the technical service concerned. We will do our best to resolve it as soon as possible. We would like, on behalf of the whole team, to present our sincere apologies for the inconvenience. Hoping to welcome you again very soon at the Sanctuary Namngum Beach resort. My team and I wish you all the best. The location is just perfect for a city/work getaway, peaceful and stunning. Small children need to be watched from falling in the lake, but the resort staff is very friendly and patient with kids. We had a good time here. The view is very nice and the rooms are fantastic. The food was good and the prices, while being much higher than in town were good for a resort. My only complaint is the same complaint I have basically everywhere in Laos, the staff leaves something to be desired. There must have been 3 employees for every one guest at the resort while we stayed there but they weren’t particularly attentive. We ate breakfast while being watched by six employees but no one ever filled our coffee. Not a huge deal but the resort has such potential. My other complaint was that on the first night an employee followed us out to our vehicle as we were leaving, to go explore the town,to tell us that we couldn’t go without paying our tab of $6.50. The hotel allows you to keep a tab for the length of your stay. We explained that we were coming back. Again, not a huge deal but very unnecessary. We had prepaid for two rooms for two nights so skipping out to save $6.50 absurd.